All companies exist in a competitive environment, and a completing a competitive analysis template (also known as a competitor analysis template) allows you to review how your company stacks up against both your direct and indirect competitors. Direct competitors: These are businesses that offer essentially the same products or services as your company. Indirect competitors: The classic definition of indirect competitors is companies offering products and services which aren’t the same as yours but which could satisfy the same needs. However, for the purposes of a competitor analysis, you should also include companies from different industries which don’t compete with you at all currently but which have the potential to switch to become a competitor. When completing a competitor analysis template you compare your company against your competitors for each of a range of competitive factors. Assist your strategic decision making. 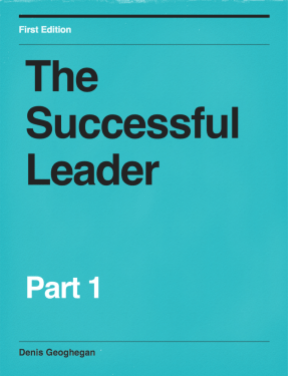 Highlight the strengths and weaknesses of your own organization, as well as those of your competitors. Uncover potential opportunities in the marketplace where you can gain market share, gain a competitive advantage etc. Enable the whole of your organization to better understand the competitive landscape in which your company operates. Help inform your value proposition, that is, how you stand out in the marketplace compared with your competitors. Pro Tip: It may not be immediately obvious who all of your competitors are, particularly in regard to your indirect competitors, so it’s a good idea to create and maintain your competitor’s analysis template over time. As an example of an indirect competitor let’s look at Google. It may not be obvious but Amazon can be considered an indirect competitor of Google. Why? Because Google makes money when people search for products or services and Google is able to display an ad for that product or service. This only happens for searches where there is purchase intent, not for searches where there is no purchase intent, such as obscure long-tail terms. If Amazon were to expand to such an extent that they literally sold everything, then consumers might start to completely bypass Google and go straight to Amazon whenever they wanted to buy something. This would obviously be disastrous for Google’s business model and is why Amazon can be considered an indirect competitor of Google. A much more obvious example of an indirect competitor is that if your company sells car insurance then an indirect competitor might be a company that currently sells only home insurance. Company Profile: This section provides a general profile of the company in question and might include information such as when the company was formed, how many employees it has etc. Key Competitive Advantage: This section highlights the key competitive advantage that the profits of this company are based upon. This is often the last section of the competitive analysis template you complete after all other sections are complete. Target Market: The group of consumers (for B2C) or companies (for B2B) that the company’s product is aimed at. Market Share: The proportion of market (defined as a percentage) controlled by the company. Marketing Strategy: The methods the company uses to promote and sell its products and services. Products & Services: Lists the products and services that the company offers. Pricing: Lists the pricing of the company’s key products and services. Distribution Channels: How the business sells its products and services. This could be either directly to the customer or through a chain of intermediaries e.g. wholesalers, retailers, affiliates etc. In this section, we analyze each company in terms of its strengths, weaknesses, opportunities, threats, and trends. Strengths: Lists the internal capabilities or resources that are a key strength of the business. Weaknesses: Lists the internal capabilities or resources that are a weakness of the business. Opportunities: Lists the external factors the business might choose to capitalize on and use to its advantage. Threats: Lists the external factors which might pose a threat to the business or one of its product or service lines. Trends: A traditional SWOT analysis alone can be somewhat myopic in nature, causing a company to fix or improve its internal processes. For this reason, a Trends section is included, forcing a company to consider wider trends such as technology trends that may disrupt the business, for example, self-driving cars are a huge non-immediate threat to car insurance businesses. 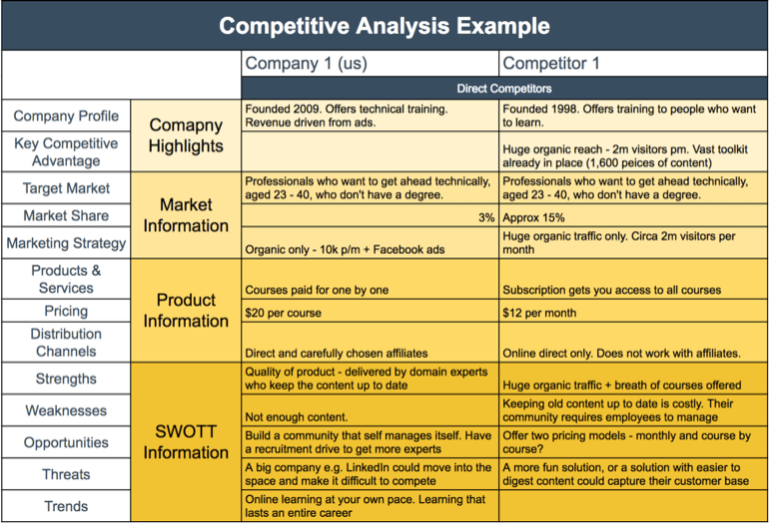 You can download a free competitor analysis template here. A more professional paid-for version of this template is available here. A Competitor Analysis template is a tool which can be used to help you outsmart your competition by helping you to spot opportunities and threats and make the right strategic decisions. It is a working document that should be regularly updated and can be used to gain alignment within the organization around where it competes with competitors.